Dan Cotton scored for Yaxley against Sleaford. Yaxley’s dynamic strike duo of Phil Stebbing and Dan Cotton were both on target in a 2-1 win over Sleaford at In2itive Park last night (March 14). It stretched the Cuckoos’ unbeaten run in the United Counties Premier Division to four games and consolidated third place in the table. Yaxley are now three points clear of fourth-placed Desborough. Jake Duffy scored the winning goal for Stamford at Loughborough Dynamo. Stebbing fired Yaxley in front in the first-half with Cotton adding a second after the break before a late consolation goal for the visitors. And it’s four games unbeaten - a run that includes three wins - for Stamford AFC in Division One South of the Evo Stik Northern Premier Division after a 1-0 win at lowly Loughborough Dynamo. Jake Duffy scored the only goal of the game 20 minutes from time as the Daniels moved up to 15th. 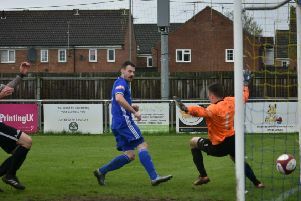 Spalding United’s play-off hopes were boosted by a 5-2 defeat for seventh-placed Leek Town at second-placed Witton Albion. Spalding are third.